As part of an initiative to enhance and expand the company’s ability to support end users, as well as its distributors and dealers, Perkins has opened a North American Regional Logistics Center (RLC), in Elizabethtown, Ky. The RLC stocks more than 7,000 parts with more than 30,000 additional parts available from across the Perkins network. In today's globally competitive diesel engine market, engineering and manufacturing a world-class product is only the first step toward building a successful customer relationship. Supplying the technology, parts and service capabilities required to keep those engines running may be even more important in the long run. That's not an easy thing to do in a world conditioned to expect instant response and seamless support with a few clicks on a website. Traditional parts warehousing and distribution channels simply aren't responsive enough to meet many of the demands of today's customers. "The experience our customers expect online today is very different," explained Nick Morgan, supply chain and operations manager of Perkins. "They're used to ordering from places like Amazon and want everything tomorrow, or maybe even later today. To remain competitive, we have to make that happen through things like e-commerce channels, online buying and our network of distributors and dealers. "To accomplish that in North America, we determined that the best strategy was to place a quick- response logistics operation for Perkins genuine parts in a central U.S. location. That was the genesis for Perkins's new regional logistics center (RLC) in Elizabethtown, Kentucky. It is located in 37,000 square feet of dedicated floor space in the 400,000 square foot UPS-SCS multi-client Kentucky Distribution Center in Elizabethtown." 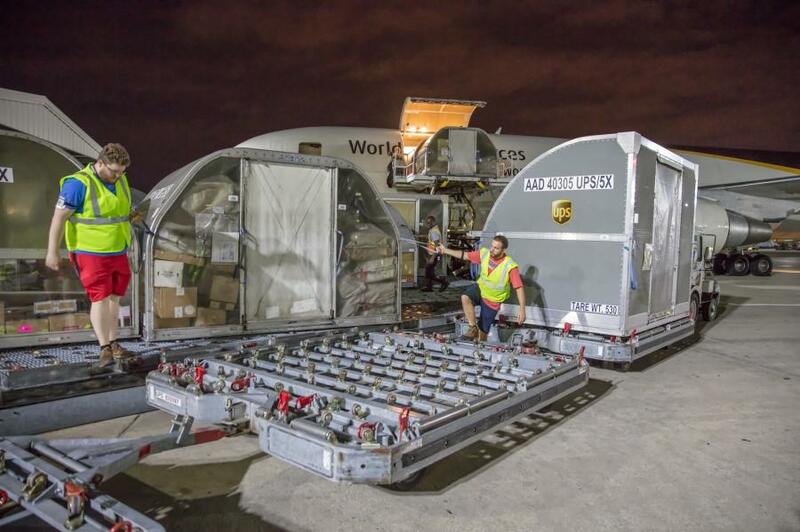 The Elizabethtown location was chosen both for its proximity to the UPS Worldport facility less than 50 miles away at Louisville International Airport and its access to the U.S. Interstate highway system to facilitate ground shipments across the United States and Canada. The close proximity of the Perkins RLC to the UPS Worldport means that customers in the eastern United States can place orders for next day delivery until 8:00 pm and west coast customers can order until the end of their business day also for next day delivery. The Perkins RLC stocks more than 7,000 spare parts, each of which has been ordered at least three times in the last three years. Less frequently ordered parts will be shipped directly from the Perkins distribution centre in the UK. The RLC also is an integral part of Perkins on-line parts ordering system accessed via the perkins.com/shop website. Targeted at end-users of Perkins powered equipment, rental businesses, repair and engineering shops plus mobile service and repair engineers, perkins.com/shop allows U.S. customers to purchase genuine Perkins parts over the internet. Most of those parts will be shipped from the RLC to expedite delivery to the customer. "The RLC is just the first step in implementing a new business model for our global aftermarket business," Morgan added. "The future will be driven increasingly by data generated by engine telematics like our PerkinsSmartCap and the PerkinsMy Engine App. That data will let us more precisely forecast what parts will be needed and when and where to support stocking decisions for facilities like the RLC. "A big advantage of the data driven approach is that it brings us a lot closer to our end-customers so we can get feedback directly and use it to improve our service," Morgan said. "Customer service engineers can live chat with customers in real-time. The future of parts and service is proactive and that's where we're going."